Hige Oyaji "Ban Shunsaku, Tetsu, Higeoyaji, Detective Mustachio, Mustache-Daddy, Albert, Ed"
A recurrent character in the works of Osamu Tezuka, especially Astro Boy and Metropolis, and a part of Osamu Tezuka's Star System. He has had many voice actors in many of his anime appearances, but his most famous seiyuu is Kazuo Kumakura. 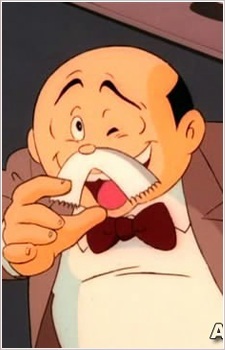 Higeoyaji appears in Astro Boy as a school teacher and detective who asserts the rights of robots, but he also frequently plays as a detective in other stories too. His many roles are a lawyer, sushi bar chef, teacher, politician, judo expert, even (in Rainbow Parakeet) a butterfly! He's really the typical amiable old man who could be a good friend/mentor, or your next-door neighbour.